Monks have had a hand in the beer making process for hundreds of years, going back to the 12th century. Monks are responsible for the introduction of hops as a preservative and flavoring agent for beer. In the Middle Ages, monks weren’t living in secluded monasteries; they lived in villages along with other people. Most monastic orders were responsible for the supply of beer to the village and outlying areas. (I'm sure church attendance was high with the promise of free beer!) In our current day and age, there are what we call "Trappist" breweries. A Trappist beer MUST be made by monks within the walls of an abbey and must be certified by the International Trappist Association. As it stands, there are 11 Trappist breweries that are allowed to have the Authentic Trappist Product stamp on their labels. Six are in Belgium, two in the Netherlands, one in Austria, one in Italy and one in the USA. Fortunately, at Colonial, three Authentic Trappist breweries are available. I absolutely love this beer, it’s one of my favorite beers, period. There is a Brett funk on it that isn't very overpowering but still lets you know it’s there. The finish is dry and that’s accompanied by a nice mineral mouthfeel. I HIGHLY recommend this beer. If you’re a Belgian beer fan, you have likely heard of this series of beers. This is their Belgian Dubbel. At 7.5% ABV, it has a slight boozy-ness on the nose. You get some dried fruit on the palate, along with some typical Belgian sweetness. 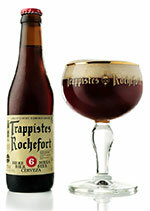 This iteration is Rochefort’s Belgian dark strong ale. Unlike the No. 6, this one doesn't have too much of a boozy note even sitting at 9.5% ABV. I like this one the best of the three. This Belgian quad is a monster at 11.3% ABV. With the high alcohol content, this one has some bitterness that’s balanced by the typical malty sweetness of the Belgian style ales. It’s great for aging and develops well over time. Some people even recommend aging this beer upon purchasing as opposed to opening it right off the bat. Like the Trappistes Rochefort beers, if you are a Belgian beer fan, you’ve probably heard of Bieres de Chimay. I love Chimay; the red label is their Belgian Dubbel and the first beer the monks of this abbey produced. This has nice apricot notes on the palate and some spice on the nose. This is my favorite of the two labels. Even at 9% ABV, the alcohol is not very noticeable. This beer was originally brewed as a Christmas beer and has some notes of mulling spices. It’s another beer that I HIGHLY recommend. With Easter approaching, there is no better way to celebrate than with an authentic Trappist beer produced by the pious monks of an abbey. For a local option, Subiaco outside of Russellville has started to produce beer that you can buy and take home. They aren't a Trappist brewery but they are a monastery with monks making beer. If you're looking for one of these beers to pair with Easter dinner, come by and talk to me or one of the other beer guys and we’ll steer you in the right direction. As always, you can follow us on UNTAPPD at Colonial Wine & Spirits to see what we have to offer and my personal UNTAPPD (jliddy09) to see the beers I've been trying lately.